LouLouLand: Daily Facial And Body Cleansing With The Magnitone Pulsar* - Warning Long Post! Daily Facial And Body Cleansing With The Magnitone Pulsar* - Warning Long Post! I guess I should start this post with an apology - I went sent this product towards the end of last year and the intention was to use if for a month and then get a review up in time for Christmas. It wasn't to be though and in someways I'm glad about that. This product isn't the cheapest and the time span has given me the opportunity to give it a full and thorough review. So what is it ? Well in it's simplest terms it's a daily cleansing brush. 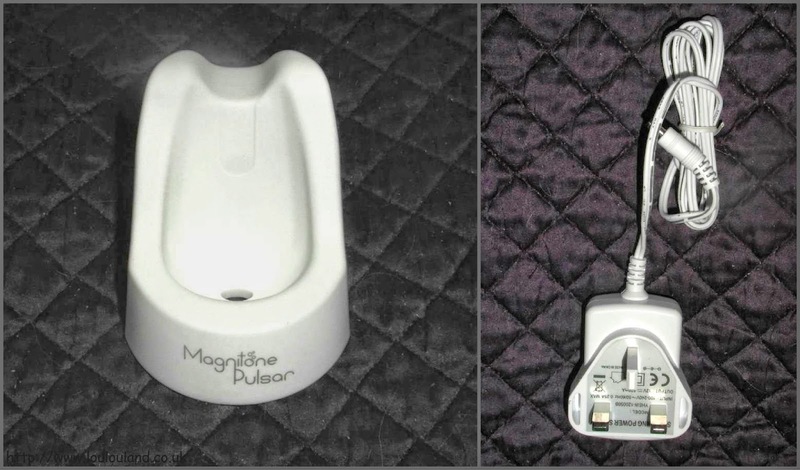 There are lots of these on the market now catering for all budgets but the Magnitone Pulsar is different. Designed with Active Electromagnetic Technology it nor only provides around 15,000 rotational oscillations a minute but also has a unique pulsing action to stimulate the skin. What Do You Get? And How Does It Work? Impressive but what do you get? and how does it work? - Well inside the box you get the basic hand held unit, a stand and charging adaptor, full instructions and two brush heads. The main handheld unit comes partly charged. It features an indicator light which flashes when it needs charging up. The unit is fully sealed and cordless so you can use safely in the bathroom and it can even be used in the bath or shower. It comes complete with it's own stand / charging cradle. You can use it to store the unit in the bathroom, and all you need to do is plug the stand into the adaptor provided to wirelessly charge your Magnitone Pulsar. The brush comes with easy to attach and remove brush heads. The brush head at the top of the picture with the blue ring is the Active Clean Brush. This is your basic daily, facial cleansing brush, ideal for deep cleansing and gentle facial exfoliation. The slightly larger brush below is the Body Cleanse Brush. The bristles on this brush are slightly firmer, and this brush head can be used in the bath or the shower for general body exfoliation and dry skin removal. Each brush heads comes complete with a ventilated plastic cover to keep it clean. Each brush head lasts about 3 months with regular use. To care for mine I just give them a quick rinse in clean water and leave them to air dry. The brush itself has a rubberised feel, meaning that it's easy to hold with wet hands. The brush operates courtesy of just two button, a basic on off switch and a mode selection button. The brush four distinct massage and cleansing settings. The first setting is Sensitive, this is the setting that you should start off on. It offers a deep cleansing experience but with a more gentle action ideal for delicate and more sensitive skins. I'll say more later but this is my preferred setting. Next up you have the setting that's unique to Magnitone Pulsar - Pulse Lift Massage. This isn't a cleansing setting really and it's a mode that you would use after say the sensitive or deep clean settings. As the name would suggest this mode gives more a massage treatment. Next is the Exfoliate setting, this setting is predominantly for use with the body brush. It's a more vigorous motion that helps smooth and exfoliate the skin.. The final setting is Deep Clean. This is the setting that the majority of people will use of they want to amp up the results of the Magnitone Pulsar and give the skin a good deep clean. This is the mode to use if you want real result. It's recommended that you start off using the unit on the Sensitive setting for the first few days to get used to it and I have to say this is without the setting that suits my skin best. There are a few ways to use it and for me it depends very much on the cleanser that you use. For more thicker and creamier cleansers I found it easier to wet my face and then apply the cleanser directly to my face before removing it with the damp brush. Where as with more liquid based face washes and cleanser, it worked just as well applying the cleanser directly to the dampened face brush, and then using on my dampened skin. Once you've worked out the best way for you, you use the brush either on the sensitive or deep clean setting and move it gently in circular motions around your face I normally split it into sections and did both cheeks, then my nose, then my forehead and finally my chin and jawline, taking about a minute or so in total. I didn't use the unit on the Pulse Lift Massage setting that often but I generally used after I'd use the brush to cleanse. Making sure my face and the brush were both wet, I concentrated specially on my chin and jawline. The sensation is very different, the name fits the setting and the unit perfectly, you can almost feel it pulsating on the skin, and the you can really feel the increase in circulation that it provides. Immediately after using the brush I noticed how pink my skin was, not uncomfortably so but it definitely exacerbated my already pink toned skin. My skin can be quite sensitised anyway so after a few uses I decided to change how I used the brush and what I used with it. As I said earlier the brush comes with two types of brush heads but you can also buy another type of brush head for more sensitive or delicate skin. So I decided to buy a two pack of Sensitive Brush Heads to see how I got on with those. Whilst none of the brush head feel overtly hard or scratchy, the sensitive one feels extra soft. It's plain white and colour and despite the softer feel you still get a good level of cleansing and exfoliation. This brush definitely suited my skin better and it's the only brush that I will use on the Deep Cleanse setting. It's recommended that you use the brush twice a day but after a week or so I realised that this wasn't for me. I've been using it once a day on a night time either on my bare skin or after I've removed my make up as part of a double cleanse. So what results did I see? well after the first couple of weeks I have to be honest and say it wasn't great - my okayish skin started to breakout - From just having the odd hormonal spot on my chin I had spots on my forehead, cheeks and on my nose! They do say that this might happen, it's just a result of the new cleansing method pulling out all the gunk and impurities out of your skin so you just need to deal with it. I upped my water intake and took a few more vitamins which I think helped. After that though the spots cleared up and haven't came back. What has came back though is much clearer and much smoother skin. I've actually had nights where I can't stop stroking my cheeks they feel soooo smooth. Other people have even commented on how much clearer and brighter my skin looks, and I've even being cutting back on the make up going barefaced eek or managing with just a BB cream. Yes the large pores are still there but they don't seem quite as obvious as they were, and the bumpiness of my forehead and chin has definitely reduced. I'm going to let you into a secret I hate upper arms! The thought of accidentally touching someones upper arms makes me feel a bit sick, and to be honest I'm not even a fan of my own. Over the last year or so I've noticed that my upper arms are starting to get that rough, plucked chick look - urgh!. So I've looked for solutions and one of the most important things are to moisturise and to exfoliate. So this was the first place that I tried using the Magnitone Pulsar, I tried on both the deep clean and the exfoliation settings with equal success again it depends of you shower product how you use it but I preferred to create a lather on my skin first before using the bush under the shower. It wasn't an in your face, scratchy or harsh exfoliation but it still felt as though it was doing something. Immediately afterwards the skin felt really invigorated and much smoother and over time I've noticed a definite improvement in the skin texture. Personally on my legs I prefer a bit more of a gritty exfoliation but for my arms and upper body, and for after hair removal I think that this does the job perfectly. Okay this isn't the cheapest product by any means and if you'd asked my a year ago if I needed one in my skin care routine I probably would have said no, but having used it and found a way to use it that suits my skin type I can definitely see me continuing to use as part of my regular routine. All results will vary I guess but I've seen enough of a change to keep using it and to recommend it. The Magnitone Pulsar is available from various retailers including Superdrug, Boots, Look Fantastic and HQ Hair. The recommended retail price is £129.99 but at the moment is on sale for half price in a lot of retailers making it a much more affordable £65. The replacement brush heads are available from the same retailers and retails for around £15.99 for a pack of two. If you have any questions on the Magnitone Pulsar please leave me a comment or check out their official website. Wow, this was a great, in-depth review! This sounds like a really handy tool, bit too pricey for me at the moment but I would love to see what it could do for my skin. Such a great review, I really enjoyed reading it. The brush sounds lovely, but I am not sure I could pay out that much money for a cleansing brush! For the plucked chicken arm look, I love Clinique's Sparkle Skin Exfoliator, it's the grittiest scrub I've ever used and after a couple of applications, my arms were so much smoother.